It's been said that having no multitouch screen allows less freedom for innovation. Maybe we could get something out of our touchscreen drivers. little bit apart, while others prefer having the fingers right next to each other. 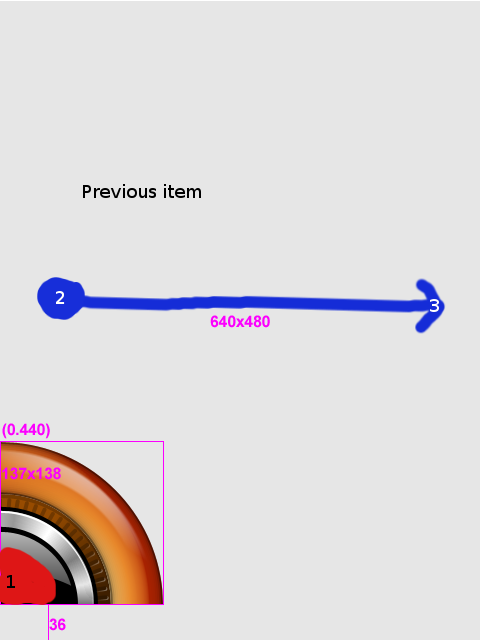 iScroll2 provides two scrolling modes: Linear and circular scrolling. line, respectively, to scroll in that direction. Maybe we can port/adapt/get inspiration from this macintosh driver. The [http://www.strout.net/info/ideas/hexinput.html hexinput] concept is interesting. What about hiding the less probable letters and increasing the remaining ones during typing? A plain old dialpad like any other phone would be a nice fallback. There are [http://www.hbmobile.org/wiki/index.php?title=GUI_Frameworks lots of possible GUI frameworks] with various software architectures that could be used for OpenMoko. GTA01 hardware uses GTK+/matchbox without hardware acceleration, and it's not enough: this is a first that a mobile Linux device has such a high DPI resolution. OpenGL ES compositing seems to have a bright future on embedded devices, because compositing seems to give natural zooming interfaces reality (at last!). Benchmarking will be needed. We have therefore to define a std testing application that would allow to compare alternatives. Please add here any idea that seems of relevance. enjoy the video demo; everything seems to be rendered software fine. More details about the implementation to come. A discussion on the community list identified a desire to have the ability to switch the OpenMoko UI into "left-handed" mode. that should remain..like the main top bar with the status icons and such. Scrollbars are the main thing I can think of right now. 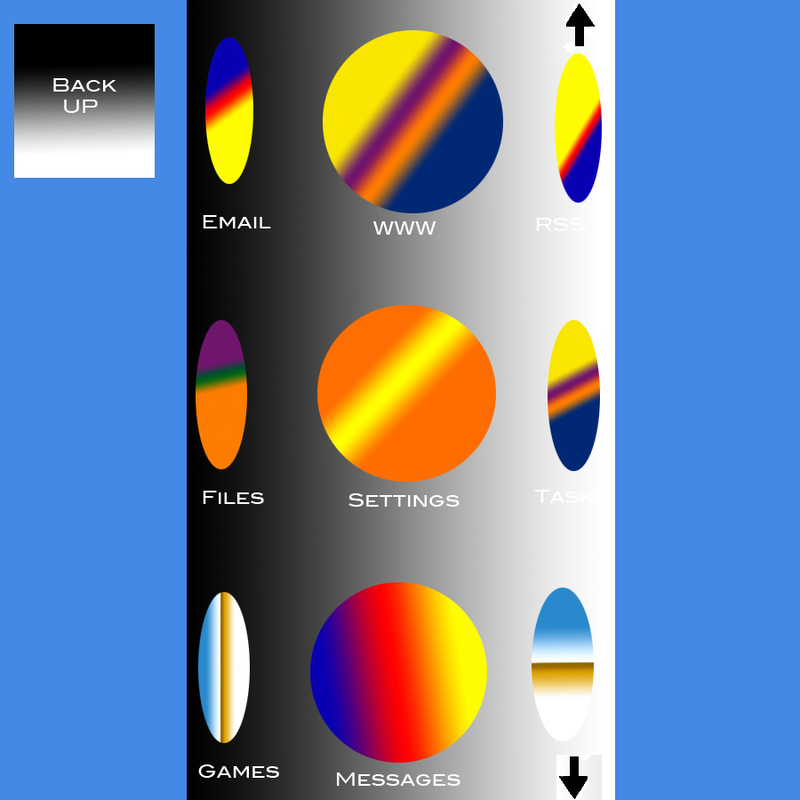 Instead of a traditional filemanager type launcher or a start menu, we could use 3D capabilities and have a cylindrical launcher. 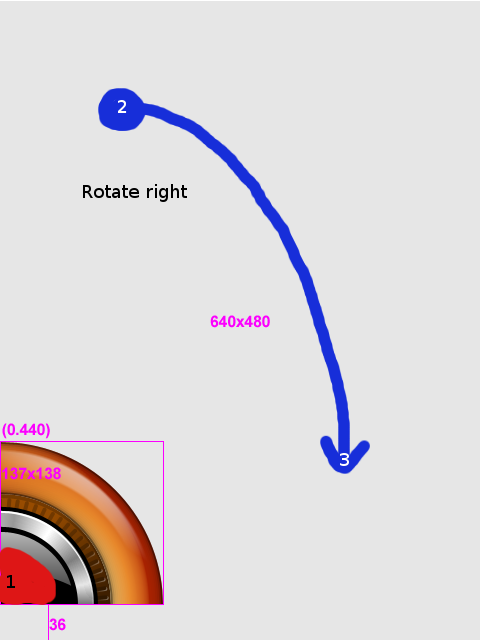 Slide your finger left and right to rotate, up and down to move up and down the cylinder. There are arrows top and bottom to indicate you can move in that direction. For when you enter sub folders there will be a button top left/right allowing you to go back up a level. Mock up of the launcher, the final version would have proper icons and the text would bend around the cylinder. 3.1 Physics-inspired animation a.k.a. "Digital Physics"
4.5.2 What is to modify ? interfaces. I can help here, too. We can't improve the human-machine interface without knowing the strengths / weaknesses of our hardware; some of the weaknesses might turn out as exploitable features, some strengths as limiting constraints. Pressure has almost no effect on a single touch, but not so on a double touch. The relative pressures will cause a significant skewing effect towards the harder touch. You can easily move the pointer along the line between your two fingers by changing the relative pressure. What does one see when sliding two fingers in parallel up(L,R)->down(L,R)? In theory you see a slide along the center line between your two fingers. In practice, you can't keep the pressure equal, so you will see some kind of zig-zag line somewhere between the two pressure points in the direction of your slide. What does one see when narrowing two fingers in slide (=zoom effect on iphone)? In theory you see the pointer stay at the center of the zoom movement. In practice, you can't keep the pressure equal for both fingers, so the pointer will move towards one of the two pressure points. what about the lcd reactivity? What if we don't see anything but blur while moving items fast? Please report here your impressions. Physics-inspired animation a.k.a. 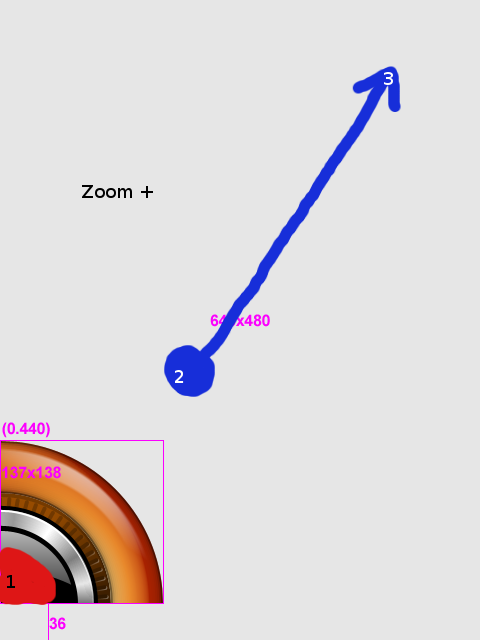 "Digital Physics"
If we want to add eye candy & usability to the UI (such as smooth realistic list scrolling, as seen in apple's iphone demo on contacts lists for instance), we'll need a physics engine, so that moves & animations aren't all linear. The following aticle explains the Digital Physics term from the iPhone example. The most used technique for calculating trajectories and systems of related geometrical objects seems to be verlet integration implementation; it is an alternative to Euler's integration method, using fast approximation. We may have no need for such a mathematical method at first, but perhaps there are other use cases. For instance, it may be useful to gesture recognition (i'm not aware if existing gesture recognition engines measure speed, acceleration...). ODE is an open source, high performance library for simulating rigid body dynamics. It is fully featured, stable, mature and platform independent with an easy to use C/C++ API. It has advanced joint types and integrated collision detection with friction. ODE is useful for simulating vehicles, objects in virtual reality environments and virtual creatures. It is currently used in many computer games, 3D authoring tools and simulation tools. The akamaru library is the code behind kiba dock's fun and dynamic behaviour. It's dependencies are light (needs just GLib). It takes elasticity, friction, gravity into account. The only (AFAIK) application using this library is kiba-dock, a *fun* app launcher, but we may find another use to it in the future. As suggested on the mailing list, it is mostly overkill for the uses we intend to have, but this library may be optimized already, the API can spare some time for too. Furthermore, Qui peut le plus, peut le moins. There's an undergoing verlet integration implementation into the e17 project (by rephorm) see http://rephorm.com/news/tag/physics , so we may see some UI physics integration into e17 someday. If we got it right, when touching the screen on a second place, the cursor oscillates between the two points depending on relative pressure distribution. Using averaging algorithms, we may have the opportunity to detect peculiar behaviours. We may correct the "half distance" phenomenon on double touch: if double touch is detected, then assimilate the cursor as twice further than the first touch. It would allow finer control, but higher instability. The double touch detection may be implemented in the driver itself, as well as stabilization. ZIP's huffmann compression applied to SMSs/mails for detecting the most used characters/words/sentences. The hexinput concept is interesting. What about hiding the less probable letters and increasing the remaining ones during typing? There are lots of possible GUI frameworks with various software architectures that could be used for Openmoko. Considering recent changes in destkop applications, opengl has a definite future. For instance, the expose (be it apple's or beryl's) is a very interesting and usable feature. Using compositing allows the physics metaphore: the human brain doesn't like "gaps"/jumps (for instance while scrolling a text), it needs continuity, which can be provided by opengl. When you look at apple's iphone prototype, it's not just eye candy, it's maybe the most natural/human way of navigating, because it's sufficiently realistic for the brain to forget the non-physical nature of what's inside. So, opengl hardware will be needed in a more or less distant hardware, for 100% fluid operation. Benchmarking will be needed to compare the different alternatives that are cited further. EFL's Evas is a powerful and power sparing canvas drawing library. It can be OpenGL accelerated. Python/Ruby bindings are available in the "proto" e17 cvs folder. Clutter, an OpenedHand project, is an open source software library for creating fast, visually rich graphical user interfaces. The most obvious example of potential usage is in media center type applications. Clutter uses OpenGL (and optionally OpenGL ES) for rendering but with an API which hides the underlying GL complexity from the developer. The Clutter API is intended to be easy to use, efficient and flexible. It does integrate gstreamer (for easy media playback, even camera or mic inputs), allows pango text rendering, cairo graphics rendering. Provided bindings are python, C# and Ruby. GTK off screen rendering is supposed to be on it's way; once it is here, there will be a possibility of using GTK apps directly within OpenGL apps as textures, which would lead to the possibility of creating a full OpenGL "application manager" (as well as media consuming app) with ZUI features. Of course it will remind you of Apple iPhone's UI. But this one runs in software mode on Nokia N770&800 already. The most notable part of Graff seems to be the inertia and physics integration in general. Fluendo's (the Gstreamer guys) Pigment is a Python library designed to easily build user interfaces with embedded multimedia. Its design allows to use it on several platforms, thanks to a plugin system allowing to choose the underlying graphical API. Pigment is the rendering engine of Elisa, the Fluendo Media Center project. 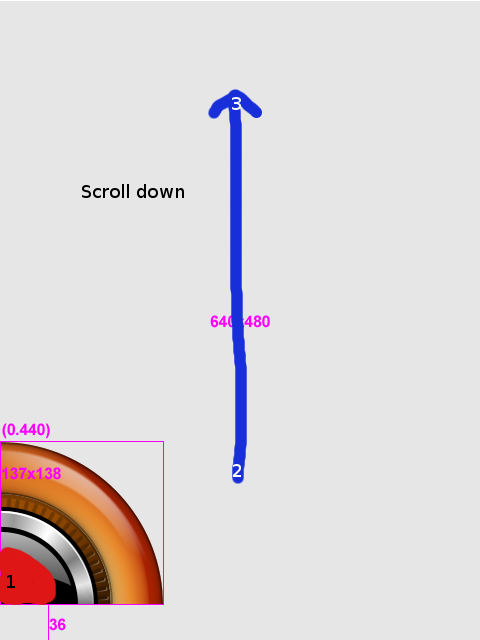 Having a scroll that isn't a 1:1 map to the user's action isn't hard. It's just an extra calculation in the scroll code. The best would be to add the feature for both finger and stylus scrolling. make the entire list a "scrolling zone", i.e. an overlay transparent scrolling widget? The same, but for the wheel. It can be very short to do: you don't have 1:1 anymore, but, for example, 1/4 wheel turn = 1 item. It's demultiplicated, but has inertia. on the left would be useful. like rotating around the first, or increase or lower the distance to the first. the so-called "first touch" can be done on the mokowheel zone itself: put your left thumb on the black area; if you touch the screen with another finger, there is a warp; the warp is detectable and allows to enter "fake multi-touchscreen mode"
who said we need multi-touch hardware? What is to modify ? We need to emulate key presses. We need to work at a layer where we can get raw cursor coordinates. <---- X server layer? There is a fake keyboard module (for dev purposes) in the main kernel tree, which could be used to simulate keyboard presses (hence keeping keyboard-enabled apps unmodified). One day we might get multitouch devices. Let's get ready. The Multi-Pointer X Server is a modification of the X server to support multiple mice and keyboards in X. It provides users with one cursor per device and one keyboard focus per keyboard. Each cursor can operate independently. MPX is the first multicursor windowing system and allows two-handed interaction with legacy applications, but also the creation of innovative applications and user interfaces. will the neo/openmoko graphics system be powerful enough for such uses? I apple uses an OpenGL ES acceleration on this device (as well as on recent iPods), which is on the way with GTA02. how does the touchscreen behave? We need a detailed touchscreen wiki information page, with visual traces. How hardware-specific is it? is multi touch really that awesome? I guess not. This page was last modified on 23 August 2008, at 09:27. This page has been accessed 71,391 times.